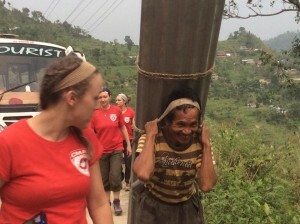 June 3, 2015 – Takukot, Nepal – With special thanks for this contribution to Jill Allison, Logistician with Team 3! “Our work continues in the clinic with queues of patients lining up to see the doctors. Crowd control is a challenge. We will begin some remote community outreach. We met with other organizations providing water and sanitation, child protection counselling and nutrition support. All Nepali staff and very knowledgeable. They are working with us here to cover all the challenges and ensure people get what they need to be safe and healthy. The government program to provide monetary compensation to everyone who lost a house was administered by the local police and army. They have finished their work and will move on to the next ward. The police are helpful and occasionally they bring their wives in for a quick consultation. The large police presence in the ruined station behind our camp has now dissipated. 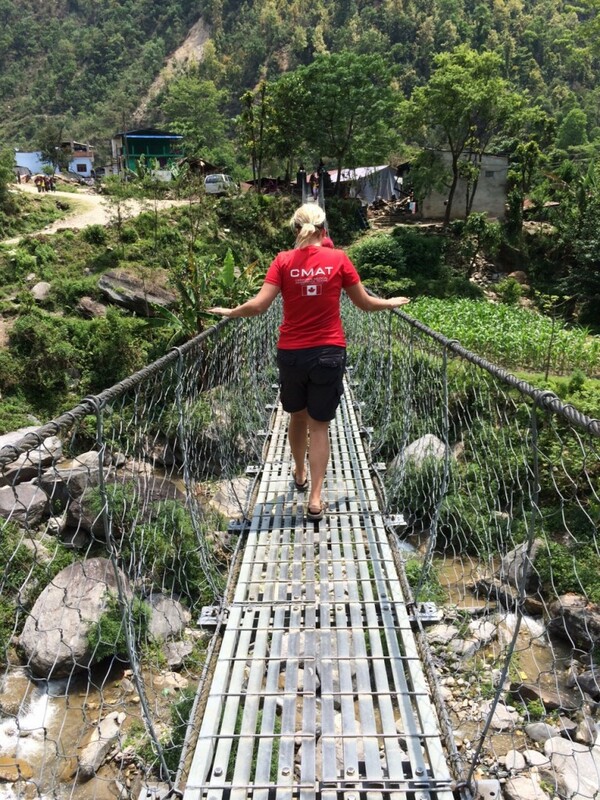 June 2, 2015 – Takukot, Nepal – With special thanks for this contribution to Jill Allison, Logistician with Team 3! “Not sure the last set of photos loaded properly as we have only intermittent access to internet. I suppose it is a wonder we have any at all considering where we are. Mountain views and lots of activity in the village of Takuakot. CMAT camp set up in the yard beside the ruins of the local police station. The school is mandated to open tomorrow and they were hastily constructing cabin type classrooms – Nepal’s version of portables – today. Without enough skilled labour to rebuild key buildings quickly things get held up even as the will to return to normal is there. The lard school has cracks in every wall and gaping chasms on every floor. And yet, the teachers welcomed us as they were planning their program and invited us to sit for awhile as they did their work. Elderly woman waiting to be assessed in the CMAT clinic in Takukot. The clinic was much more organized but just as busy today. All good. Still seeing some earthquake related trauma and doing surveillance for diseases that haunt a disaster like spectres- cholera, typhoid, dengue, malnutrition and maternal health problems. Big wind and little rain tonight. Let’s see what tomorrow brings. 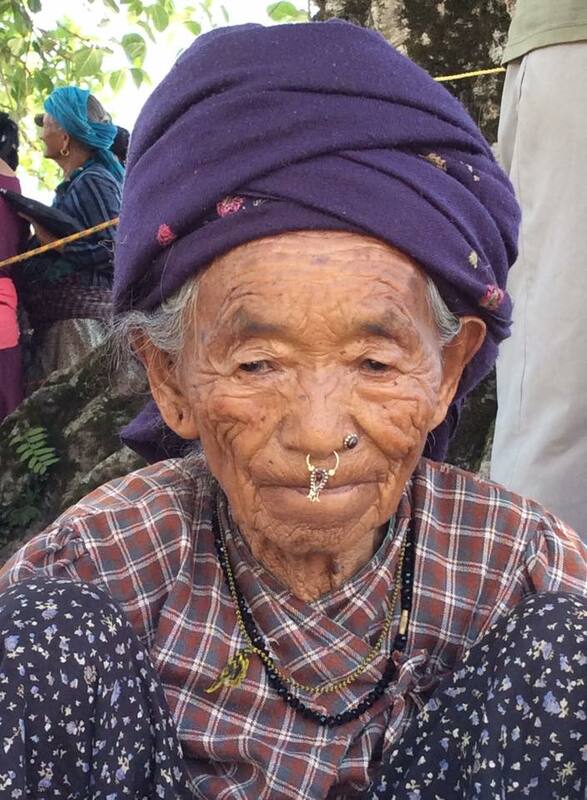 June 1, 2015 – Takukot, Nepal – With special thanks for this contribution to Jill Allison, Logistician with Team 3! 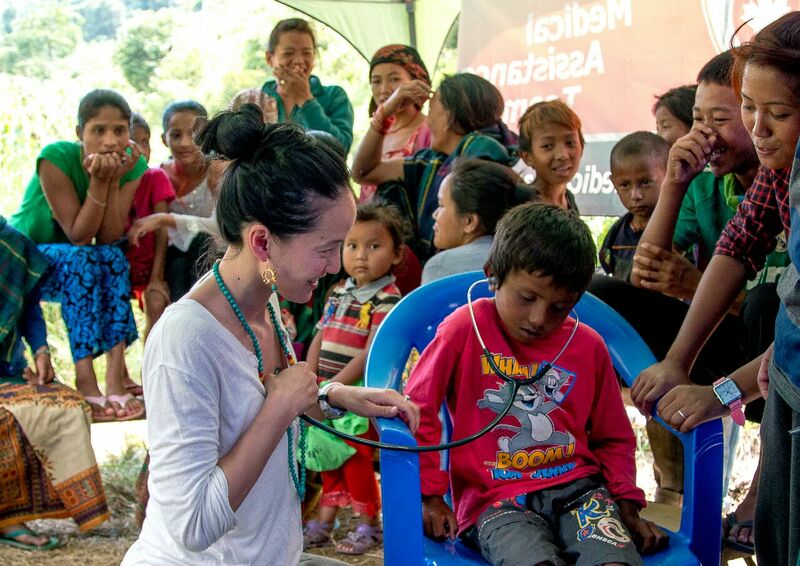 “First day in the new clinic in Takukot. Very busy day. We had so many people we could not see them all in one day. Many homes are damaged and some have already been rebuilt. The school has suffered damage and local sub health post is completely unusable. The community health worker and auxililiary nurse midwife are seeing people in a tent behind what remains of the building. When they will have a new building is hard to say. Krishna and Nirmal are wonderful professionals who have helped us tremendously. Today is hot and steamy after a heavy rain last night. Everywhere we hear the sound of industry as the community replaces their infrastructure. This is a remote community where cell phones are less obvious and the impact of the outside world doesn’t reach. May 30, 2015 – Takukot, Nepal – With special thanks for this contribution to Jill Allison, Logistician with Team 3! Dr. Tonia Temperley-Berg getting her heart checked, just to make sure it hasn’t completely melted yet. “Long journey from Kathmandu to Takukot in Gorkha district. We drove for ten hours on roads that grew ever narrower, on steeper cliffs and higher up the mountainside. We passed through villages where nearly every house was a pile a rubble. We passed houses with cracks and sagging rooflines and missing backsides. We passed trees laden with flowers in front of scarred walls and crumbling porches. 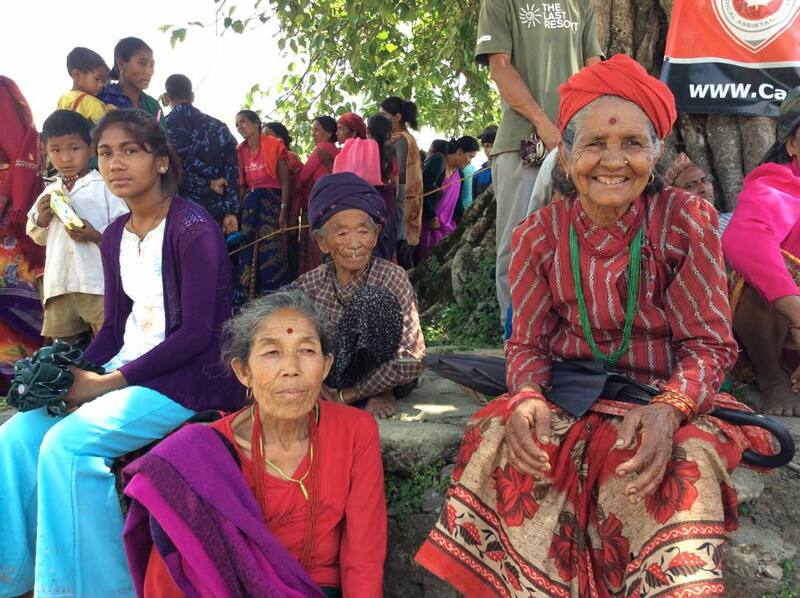 And everywhere the Nepali faces are aglow with smiles . Everywhere people are rebuilding with remains of old house and stones and brick. Back breaking labour and beautiful dispositions as children shouted “Namaste! !” We came upon an impromptu market in the middle of the road as people were bargaining for sheets of corrugated metal roofing recently delivered. Eventually our driver conceded defeat and would go no further. We began an hour long walk uphill with our tents in our packs as dusk approached. Paramedic Brian Taylor encouraging a young guy to take a deep breath! Media Sources along with CMAT logistics resources have all reported that a river in northwestern Nepal has been blocked by a landslide, causing the formation of an artifical lake approximately 2 km long. Villages downstream are being evacuated, in case the landslide gives way. CMAT can confirm that Team 2 is working in a village which is several hundred kilometres to the east of this site, and remains safe. 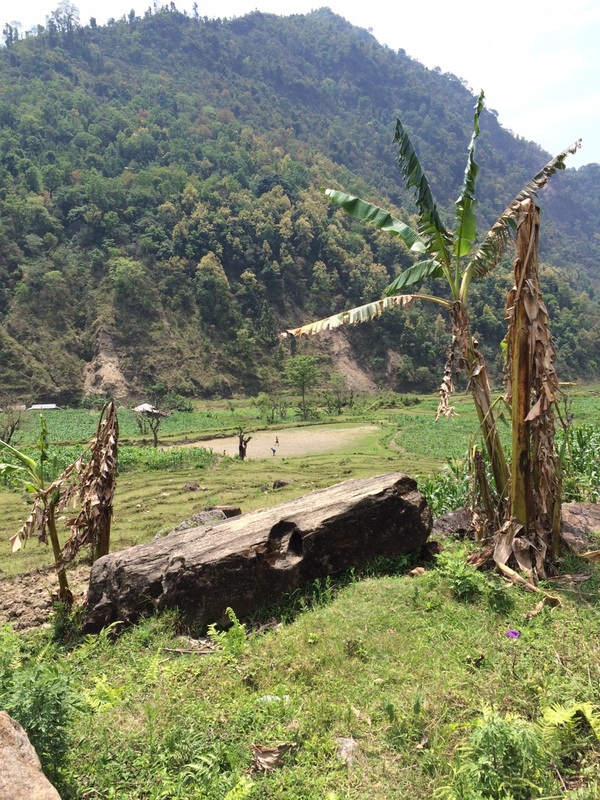 Team 2 has been busy treating basic primary care issues in Baluwa and trekking to surrounding villages to follow up on some more serious cases, but the need there is quickly returning to pre-earthquake levels. The Health Cluster in Gorkha this week has also indicated that a particular neighbouring region was seeing a small surge of patients, and so CMAT sent a small strike team to this region to meet with the District Health representative. Pending confirmation, CMAT will be transitioning to this new area to assist in the surge capacity. 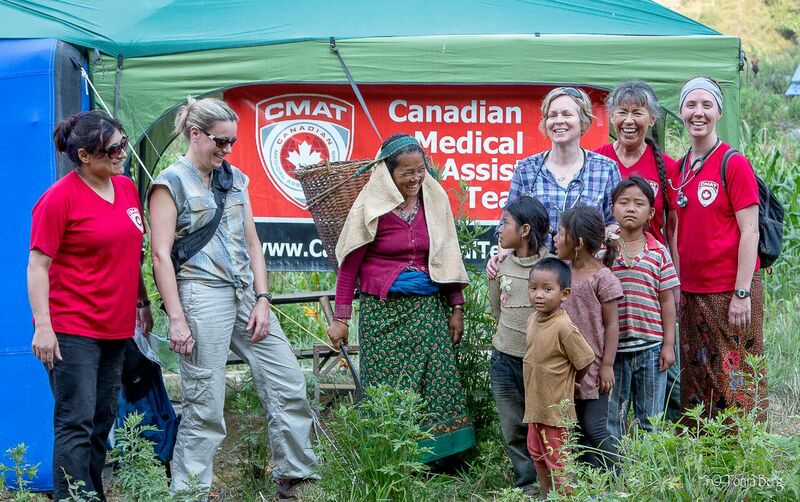 CMAT Medical Volunteers conduct a well-baby check up in Baluwa, Nepal. Scott Haig, Paramedic, Vancouver, BC. 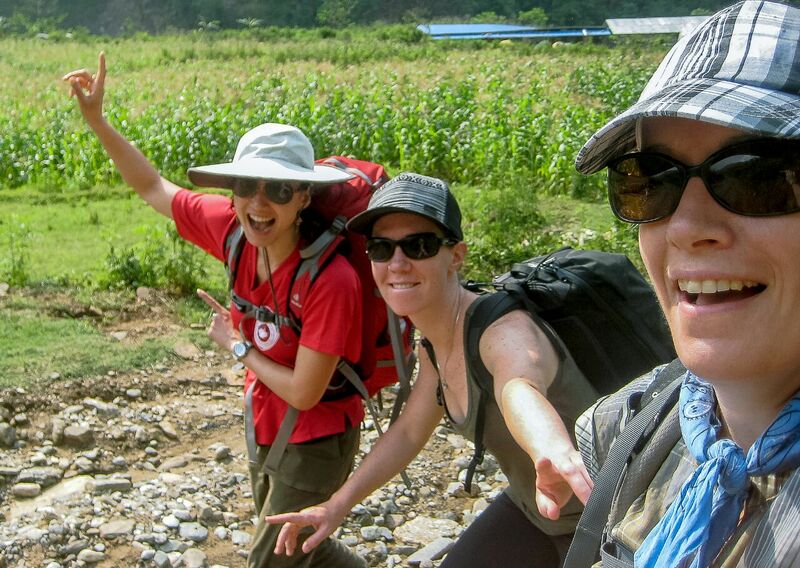 CMAT Team members have been trekking to high mountain villages, and through rice fields to deliver health care to patients who would otherwise go without. CMAT would like to extend our sincerest and most heartfelt thanks to all our donors and corporate/ organizational sponsors for helping make this deployment such a success. CMAT Team members meet some of the local women and children. 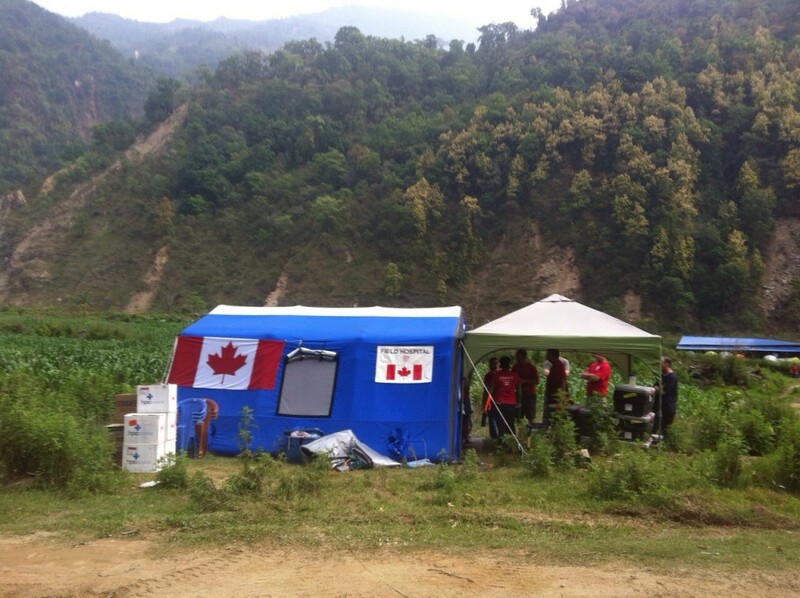 May 20, 2015 – Canadian Medical Assistance Teams’ second team of medical volunteers recently arrived to begin their rotation in Baluwa, Nepal, relieving outgoing team 1 members returning to Canada. CMAT has been working in the earthquake-affected region for just over 3 weeks now. Monsoon season is rapidly arriving, and the team is seeing more and more rain throughout the day. These rains affect not only the work the team is doing, but also accessibility to the remote region. Volunteers continue to trek up steep hillsides to villages, in order to follow up on patients needing medical care. 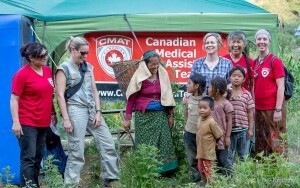 CMAT Clinic in the Baluwa Valley, approximately 8 hours Northwest of Kathmandu, beyong Gorkha. Aftershocks continue to rock the area, including a 7.4 magnitude tremor which shook our team members this morning. Everyone is safe and accounted for. 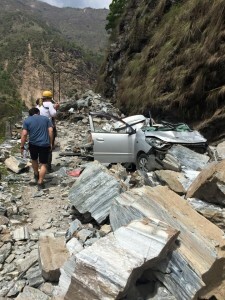 May 12, 2015 – Baluwa, Nepal – CMAT Team 1 was sound asleep when another major quake measuring 7.4 on the Richter scale shook them awake at 3:00 this morning. All team members are safe and accounted for, and there have not been any reports of injuries or deaths in the immediate vicinity. Virtually no one in the local communities remains in their homes as they are either all demolished or in severe disrepair. Families are sleeping under tarps or in the open. Several teams have arrived into the area to help with the rebuilding process, and Nepali soldiers were reconstructing the school building adjacent to CMAT’s camp. 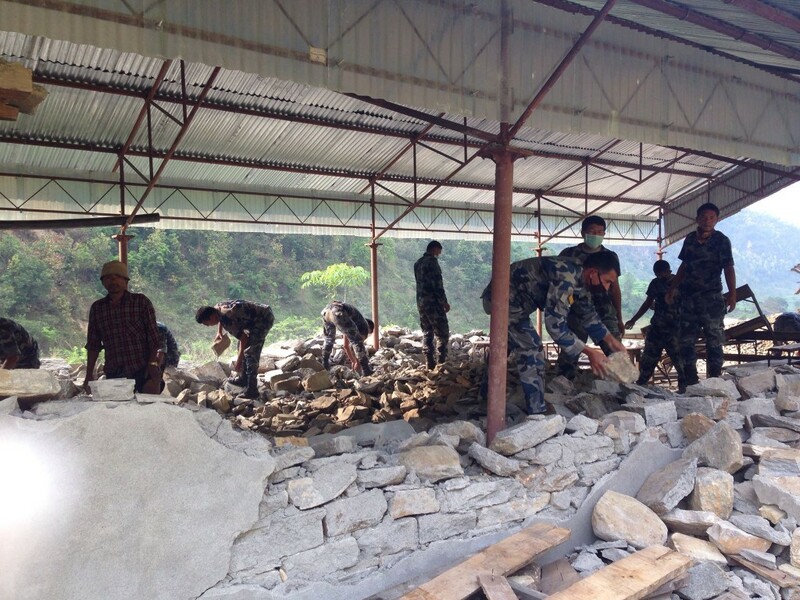 Nepali soldiers have arrived in Baluwa to help reconstruct the school adjacent to where CMAT team members are camping. 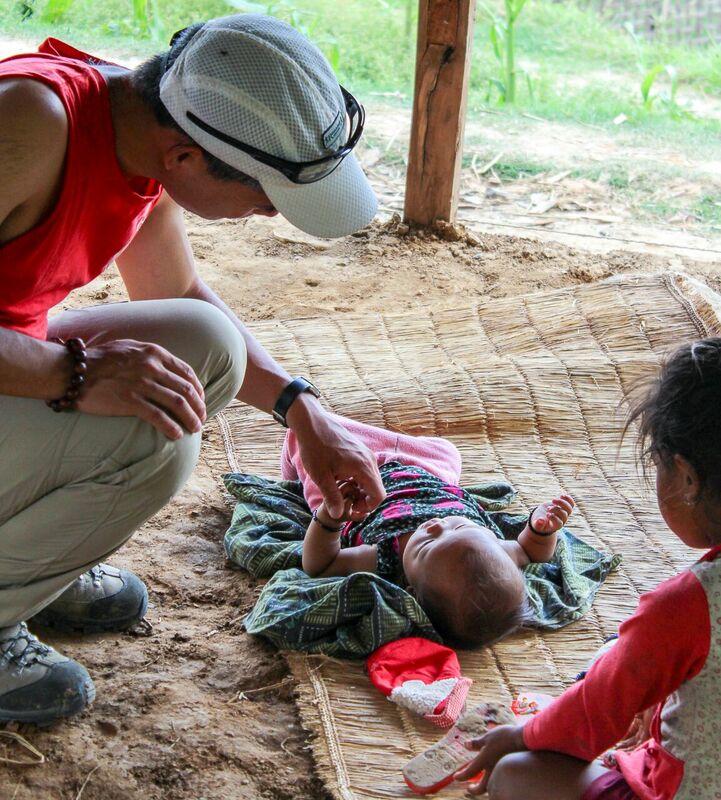 CMAT medical teams continue to see dozens of patients each day, and on one of the mobile medical clinics conducted in a high mountain village, team members intervened to help save the life of a small child who had been suffering acute diahrrea. After stabilizing the child and providing hydration, a helicopter was brought in to medi-evac the child to a centre which could provide a higher level of care. 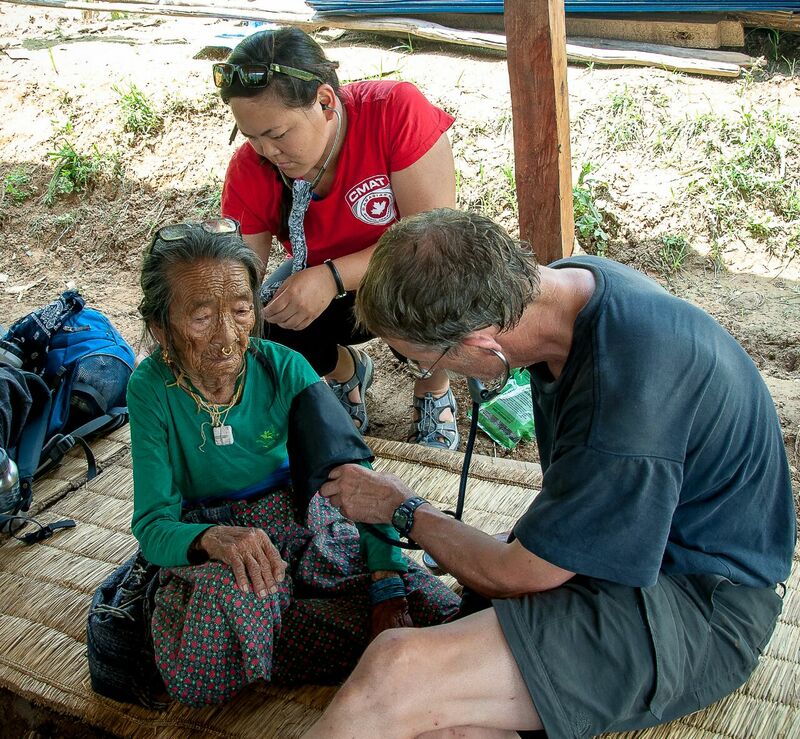 CMAT Team members have been trekking to remote mountaintop villages running mobile clinics to assess and treat patients who would otherwise not receive medical attention. CMAT Medical team 2 is preparing to deploy to Nepal this coming weekend, and CMAT continues to rely on its generous donors for support. Donations can be made at at CanadaHelps, and any donations made by May 25th will be eligible to be matched by the Canadian government. CMAT Vice Chair Kate Auger, and Team 1 Leader Teresa Berdusco in the village of Balowa conducting rapid health assessments on behalf of WHO. 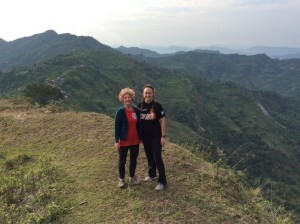 Thursday May 7, 2015: CMAT Team 1 arrived in Nepal early late Sunday night, and got on the road in the early morning hours of Monday, heading for the town of Gorkha, approximately 7 to 8 hours drive northwest from Kathmandu. Having established a solid working relationship with the World Health Organization (WHO) – led health sub-cluster based in Gorkha, CMAT has been tasked by WHO to conduct rapid health surveillance in rural and remote communities outside of the main centre. Currently the team is based in the village of Balowa, with a few members conducting the health assessments, and the remainder focusing on clinical care delivery. 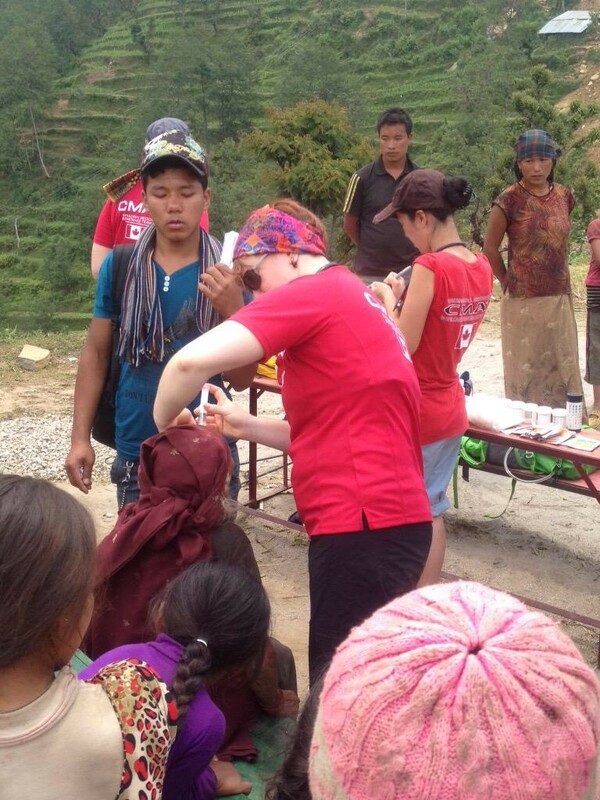 Part of the team initially started providing health care through mobile clinics, trekking up to isolated high mountain villages by foot, as no vehicles are able to access. In the wake of the earthquake, CMAT arrived in the region to help support the local infrastructure. 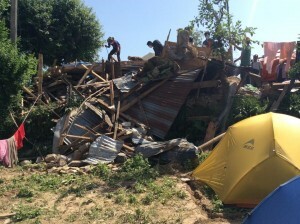 The birthing centre and health centre in the region were completely destroyed by the quake. As such, basic medical needs are not being met at this time. CMAT’s field clinic is presently serving the needs of the community of Balowa, as well as more than 10 neighbouring villages. The Bridge across the river when going from camp to clinic. In the monsoon season, the water becomes very high. While CMAT team members were still seeing earthquake related injuries even up until today, this will continue to decrease. However, the underlying primary health needs remain. Monsoon season in its truest sense will be starting in June and the heavy rains with it brings the increased risk of communicable disease. It has been recommended that subsequent teams which are sent by CMAT comprise of 8 to 10 primary health care providers (MD/ NP), nurses and paramedics. We also plan to deploy members of our Behavioural Health Committee, to begin assessing and treating Mental Health and Psychosocial issues. 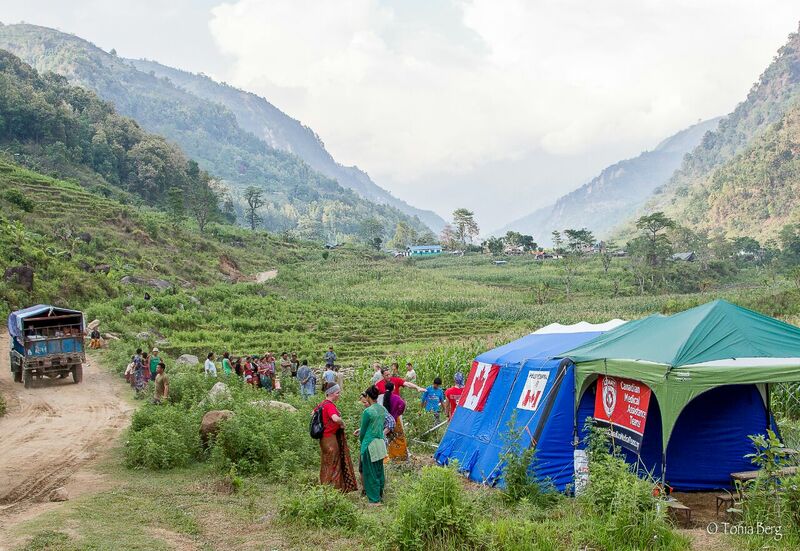 CMAT Field Clinic set up near the town of Balowa in rural Nepal. The team set up the field clinic on Tuesday and started seeing between 60 and 100 patients per day. In collaboration with the local community elders, a soccer pitch was identified which would serve as a helicopter landing zone in the event of critical emergencies requiring medi-evac. A critical patient arrived at the clinic after dark – an elderly lady with a probable hip fracture. Unfortunately, she was unable to be sent by helicopter due to the time of day, and steepness of the terrain, making a helicopter difficult to land. The flat area is a local soccer pitch, which doubles as our Heli Pad Landing zone. CMAT has secured helicopter air support for critical medi-evacs. Now that CMAT Team 1 has established itself on the ground, this message will detail the info we need to assemble teams for potential subsequent deployments. Although we are looking at a potential project duration of 60 to 90 days, the situation remains fluid, and needs can change with a moment’s notice. We have answered the call for international aid from the Nepali government, and been assigned to the town of Balowa and its environs. At present we are collecting names of volunteers who may be needed to assist on the ground withTeams 2 and possibly 3. Team two is tenatively scheduled to depart around May 15 or 16, returning around June 2 or 3rd. Team three would overlap by a few days, and stay on til mid-to-late June. Once deployment dates are set, they are firm. Teams must travel in and out of the field location as a group, and there will be no deviation from the set schedule permitted. This is due to the nature of the extensive road travel involved to arrive at the site (8 to 10 hours one way by road). THIS IS CONSIDERED AN EXTREME HARDSHIP MISSION. Camp conditions are very basic. This includes using a pit latrine dug by hand, sleeping in tents on the ground on cold evenings, purifying our drinking water, and eating locally prepared cuisine and/or Ration packages. Everyone must pull their weight, especially around camp. While CMAT provides some logistical supports in the field, ultimately YOU are responsible for yourself, espeically in being prepared with your own equipment and supplies. Aftershocks are a daily occurrence, and can be very unsettling to both the local community and to ourselves. Evenings and overnights can be very cool in the outlying regions. Monsoon season is approaching quickly, and daily downpours are not uncommon. Rainproof gear and groundsheets for your tent are highly recommended. Communicable disease is VERY common, in particular gastroenteritis. Japanese Encephalitis is endemic to the region, and while the vaccine is highly recommended, it is not mandatory at this time. The local culture is very conservative when it comes to social taboos, especially around attire. Please pack accordingly. (i.e. in public, there are to be no short-shorts, tank tops, etc.) Additionally, there is a no-alcohol consumption policy in effect for this mission. Even though there is a natural spring in camp, its important to purify the water before use. Alternatively, once your profile is activated, you can upload these documents to our website. IMPORTANT: Please indicate the specific dates within the ‘availability field’ dates which are fully confirmed, (i.e. tentative or “pending shift trades” etc. don’t count as time must be confirmed), as well as indicating maximum possible duration of your availability with specific dates. ALL FIELDS ON EXPRESSION OF INTEREST SHEET ARE MANDATORY. We currently do not have the time or resources to manage the overwhelming number of applications in any other format. Incomplete forms will not be considered. Do not worry if you have already submitted this (ie you have received this message twice). Please DO NOT RESEND. To date, all .xls files received have been reviewed by our deployment committee. Please understand that we are all volunteers (even us here at home!) We are getting inundated with hundreds of emails and phone calls every day, as well as working hard on response coordination (and our own full time jobs!!). By sending back your complete Expression of Interest excel sheet, we will place you on our list, but only shortlisted candidates will be contacted. Every dollar counts when we are responding to disaster. We are aiming to raise $100,000, and have nearly reached the $50,000 mark in about two weeks!! You can help by clicking above and donating generously through CanadaHelps.org!! 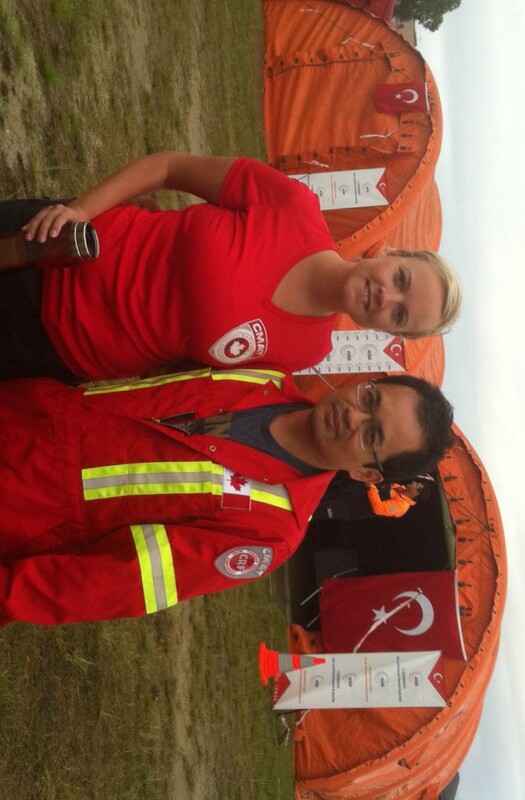 CMAT Assessment Team Leader Kate Auger, and Director Dr. Pat San Agustin await instructions in the UN Compound near Kathmandu Airport – April 29, 2015. 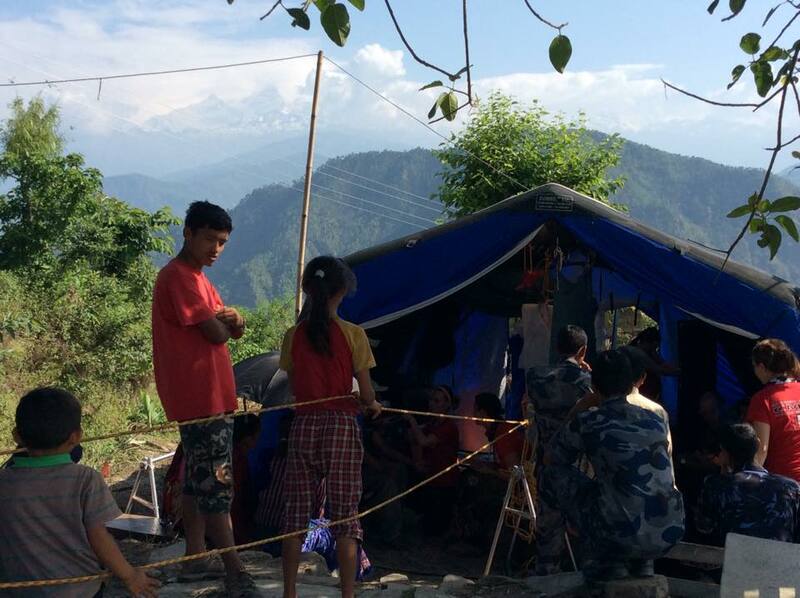 Saturday May 2, 2015: The CMAT Assessment team conducted an assessment of the devastated region of Gorkha early Saturday morning, and completed a survey of the city, as well as several rural villages in the environs. The devastation in the region was nearly total, as homes and businesses could not withstand the power of the magnitude 7.9 tremor the region experienced on April 25th. 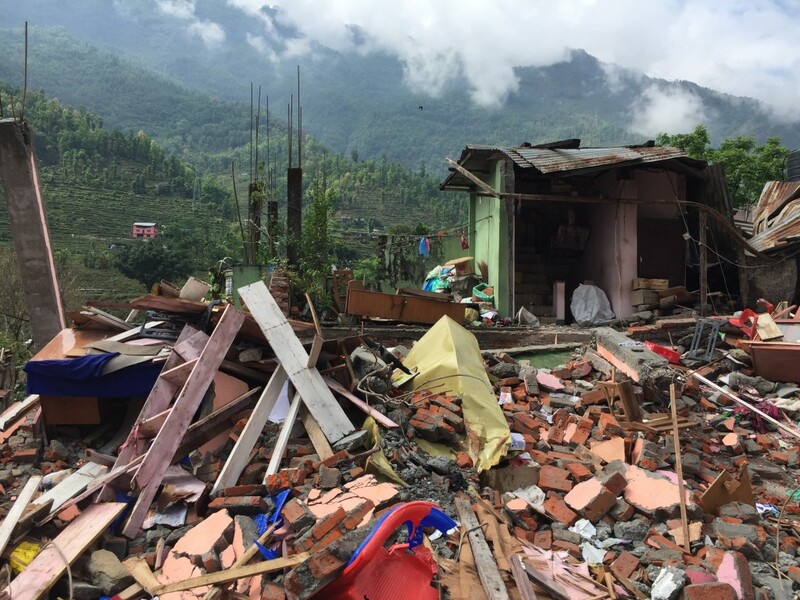 Buildings had collapsed, rockslides blocked roads, and the community has moved to sleeping in the open, terrified of what the next aftershock might bring. On instruction from the World Health Organization (WHO), the team visited several health facilities, birthing centres and community health centres to get a better picture of the needs of the population, and to report back their findings to the UN Health cluster. CMAT is to date, the only NGO assigned to this area. The popuulation of the village is about 2500 ppl, and it has a number of outlying communities which can be accessed to do small mobile clinics. This is a key location as it is 25km from the epicentre of the earthquake. Though the trip to Gorkha normally takes only 4-5 hours from Kathmandu, beyond that the team will be travelling through steep mountainous terrain. The road conditions from Kathmandu to Gorkha are excellent, but the passage to the selected site beyond Gorkha will be much slower as the roads are much more affected. 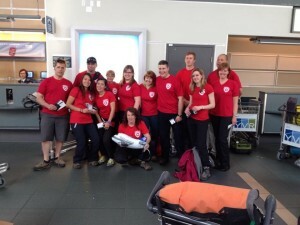 CMAT Medical Team 1 gathers at Vancouver International Airport awaiting their flight to Nepal. 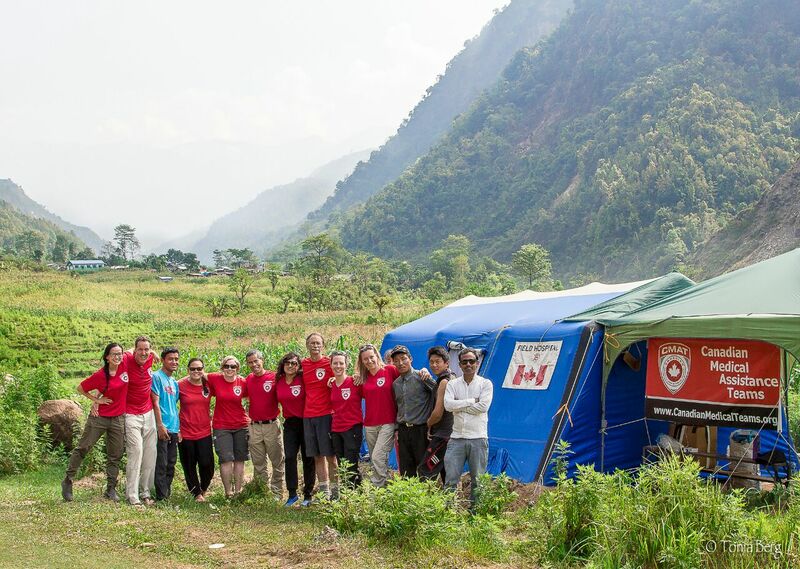 CMAT Team 1 was assembled over the past few days, and together with the field hospital, medical equipment and supplies, as well as medications supplied by Health Partners International Canada (HPIC) . 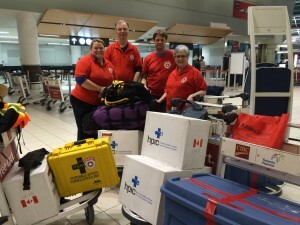 Team members departed from Toronto’s Pearson International Airport, and Vancouver International Airport, and will be greeted in Kathmandu by the assessment team in the late evening on Sunday May 3, 2015. Teresa Berdusco, RN (Team Leader) Edmonton, AB. CMAT Team 1 Members setting off from Toronto. Jenette Ziegler, ACP from Burnaby, BC. CMAT Director of Communications Lesley Eltom accepts a cheque from Arbor Memorial Foundation for CMAT’s relief efforts in Nepal. CMAT would never be able to get off the ground without the generous help of our sponsors, supporters and donors. 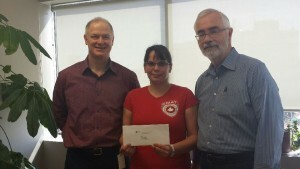 In the first week alone, our fundraising campaign on CanadaHelps.org raised over $40,000! 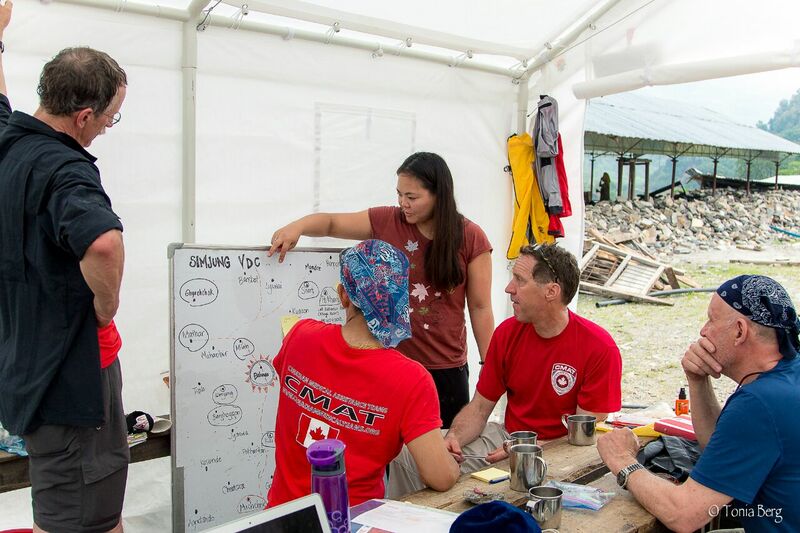 The Rapid Assessment part of the Team will conduct a needs assessment in the devastated areas around the capital of Kathmandu, to ascertain the level of devastation, destroyed infrastructure, and health needs of earthquake – affected persons, in order to prepare for the potential deployment of CMAT’s inflatable field hospital and volunteer medical personnel. The Urban Search and Rescue (USAR) part of the team will use electronic and mechanical technology to locate, rescue (extricate), and medically stabilize individuals trapped in confined spaces. It is considered a “multi-hazard” discipline, as it may be needed for a variety of emergencies or disasters, including earthquakes, hurricanes, typhoons, storms, tornadoes, and floods. The Canine Search part of the team (handler and canine) plays a critical role in structural collapse incidents. The canines locate survivors, using their incredible sense of smell to detect live human scent, even from a survivor buried deep in rubble. – Dr. Pat San Agustin; Emergency Physician and CMAT Director from Edmonton, AB. – Michael Parker; Primary Care – Paramedic from Edmonton, AB. – Brandon Duncan*: Registered Nurse from London, ON. – Search and Rescue/ Firefighters from the Lower Mainland. Time: 23:30pm PT – meet and greet, interview and photo opportunity. As the details of the destruction trickle in, CMAT it putting out a preliminary call for medical and non-medical volunteers. Depending on the findings of the assessment and USAR teams, CMAT may deploy its inflatable field hospital, and send rotations of teams. 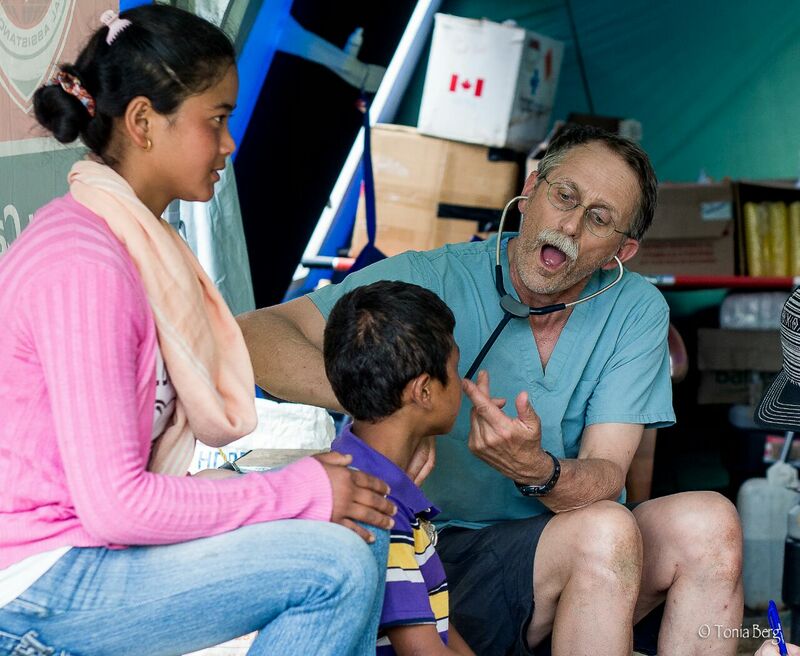 If you wish to express your interest in volunteering with CMAT, please register as a volunteer on our website at www.canadianmedicalteams.org and complete the EXPRESSION OF INTEREST FORM, (download here) emailed to [email protected]. Please note that volunteers are responsible for the cost of their travel, deployment is NOT confirmed, and is entirely dependant on the findings of the assessment team.